The SuperTrend U11 is a trailing stop indicator which is built from a baseline and a volatility offset from that baseline. The baseline can be selected from over 30 different moving averages. For the volatility offfset there are 4 different algorithms that can be used. The SuperTrend U11 is a stop and reverse (SAR) indicator that trails price action. 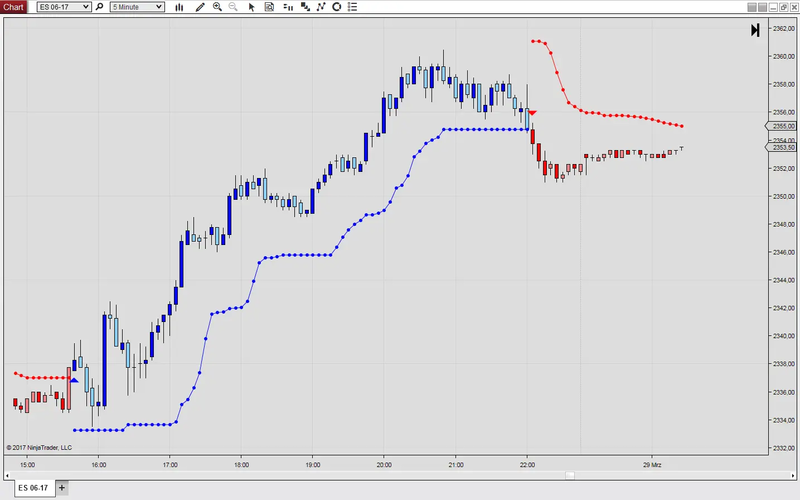 The trailing stop adjusts to both trading prices and volatility. When volatility is high, the trailing stop is further away from prices, when volatility is low the trailing stop moves closer to prices. The internal mechanics of the SuperTrend U11 can be compared to the Chandelier Stop. However, the trailing distance for a long position is not calculated from the highest high, but from a selected moving average. Also there are more options to calculate the volatility offset. The SuperTrend U11 is one of the most versatile trailing stops available. “U11” stands for “Universal” further indicating that the moving average is calculated “1 bar ago” and that the volatility offset is also calculated “1 bar ago”. Both values are calculated for the last bar, because a trailing stop should not move for the current bar, when it is approached by price. Also the SuperTrend U11 does not need to recalculate the stop value with every incoming tick, which results in a low CPU load. The SuperTrendU11 can also be used to emulate a Gann High Low Activator. For calculating the volatility offset, 4 different formulas can be used. The default setting uses the average true range (ATR) from the selected moving average. Alternatively it is possible to select the average range (AR), the residual mean absolute deviation (RMAD) or the residual root mean square deviation (RRMSD). The trailing distance from the selected moving average is obtained by multiplying the offset with a user selectable multiplier. For large multipliers there will be fewer reversals than for small multipliers. The SuperTrend changes direction, when the stopline is broken. For breaking the stop line there are two different options. A stopline can be broken intra-bar, when price first trades beyond it. Alternatively, the stopline breach can be defined via a bar close beyond the stop line. The SuperTrendU11 allows for both settings, but the second option has been retained for the default setting as it avoids whipsaws. Other than as a trailing stop the SuperTrend U11 can also be used as a trend filter. The trend can be shown via paint bars and is exposed as a public property that can be accessed by automated strategies or other indicators. The SuperTrend U11 should not be used for entry timing, unless the market is known to be trending. Entry signals generated by the SuperTrend U11 are typically delayed.